Friends! I need your help! The hubs and I are in a bit of a pickle...we can't decide which crib to purchase for Baby Schue. As I'm sure many of you can imagine, there are tons and tons...and TONS of options! Everything from traditional to sleek & modern. Stylish to eco-friendly and everything in between. I always thought I would go for a white and traditional crib, but when we found out we were having a boy, I thought it might be too feminine. I've really come around to the modern design and how many of them are two-toned. Which brings us to our dilemma...which one to pick. I would love to get your opinion, whether it's from personal experience with one of these cribs or purely because of aesthetics. This is the MUU All Slat Ray Crib...it retails for $795. I love the modern look and the two-toned wood. It's taller than most modern cribs at 37.5 inches and made from solid maple. It doesn't mention whether the white paint is non-toxic. I love the sleek design and the hint of wood tone at the bottom. It almost has a retro feeling. 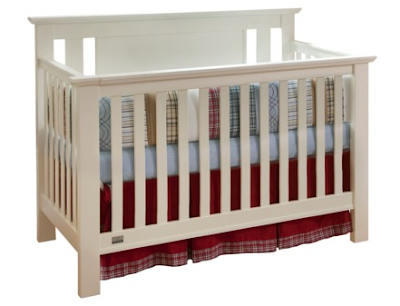 This is the Babyletto Mercer 3 in 1 Convertible Crib, which retails for $359. It also has the modern lines and the two-toned woods. There is an additional drawer at the bottom, which I've read is kind of flimsy, so it wouldn't be used for any heavy duty storage. Babyletto is known for being baby-friendly with all of its non-toxic finishes and so forth. The downside about the crib is how short it is...only 35" tall. Update...kind of in love with this similar looking crib by Baby Mod. Next up is the Netto CUB 2.0 Sleeper Crib, which I found for $695. I actually like this one a lot! It comes in a darker walnut finish, but appears to be $200 more, which is just not gonna cut it. What do you think of the beech finish? Again, love that the finish is non-toxic, and it measures at 41"...though other sites show it measuring in at 36" tall. Last, we all know how hard it is to teach old dogs new tricks. 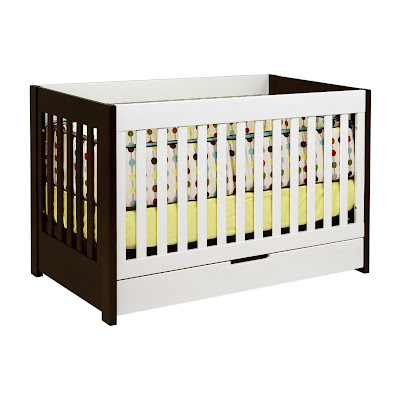 This is the Lolly & Me crib, which is the least expensive option at $299.99, and of course the most traditional. Despite it's more traditional look and low price point, this crib appears to have all the same toxic-free finishes of the modern options. The only thing it's missing is the two-tone wood, but maybe it's more versatile for children down the way. And it's also the tallest of the 4, measuring in at 43" tall. Alright, so give it to me straight. Which one is your favorite? Do you have a favorite that I'm missing? I definitely appreciate your input! I like the Netto Sleeper Crib. It's sleek and cute. We got ours at IKEA for $99. It's really basic, but we love it because it's sturdy and not too big. Sometimes there is just Too much crib. So here's a few things I'd take into consider now that I'm doing this again for a second time... Too tall of a crib and it will kill your back (maybe not for the hubby) leaning over and picking a heavier child up. Extra storage is always a plus... You underestimate just how much baby stuff you start accumulating post-delivery!! And if you're going to invest in something that's gonna be used for a few years... A convertible crib to toddler bed is ideal! Cuz let's face it... All kids grow out/climb out of their "crib" at different ages and it's just easier to convert the crib into a toddler size bed before putting them in a normal twin or full! So I think the Babyletto would be the best option from you choices!! Good luck! Hope this helps!! i love the first and second one! Check out this post (http://www.younghouselove.com/2010/02/nursery-progress-crib-notes/) from Young House Love. The cribs they looked into had a similar aesthetic to yours and they wanted a crib that was very baby safe! Naturally I love the first :) It is very mid-century modern with the legs. I think you made a mood board once with a similar buffet as a changing table. The 3rd is probably 2 diff heights with or without that base on the bottom, I'd imagine that's the 5 extra inches. I like the beech a lot. It's different and subtle. Ikea also makes a lot of products in this finish if you wanted lighter wood dressers or shelves. The Lolly is nice too for something that could transition from one room to another (future babies!) And has a nice price. I think I'd try to find a store that sells cribs and get an idea of the height you like best. I think the second one or forth one would be perfect for a boys room! If you plan on having more, I would say go with the 4th because if you ever have a girl I think the second may be TOO masculine! I adore number one, my favorite by far! 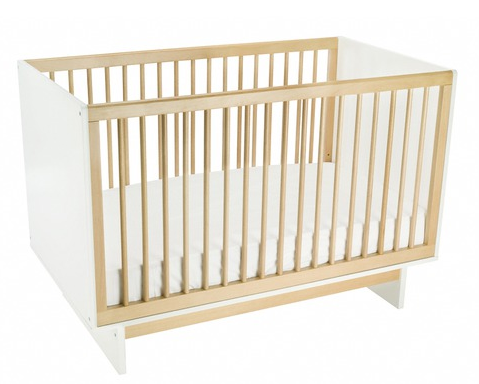 We have the Oeuff Sparrow crib which is a similar look and we love it! I have not gotten tired of it yet and will def use for the next baby wheter its a boy or girl. Can't wait to see what you choose! Initially I wanted a white crib too but with the look of the rest of our house decided to go with the dark wood. My eyes are most drawn to the Babyletto crib. I think it's unique and has a little boyish touch to it. The price isn't bad either! I guess it comes down to how big of a deal its shortness is. My second choice would have to be the Lolly & Me crib. You can't be that price and the style is classic! One super important thing when buying a crib (something no one shared with us) is to make sure that the mattress can go up and down. Ours was a modern style and the mattress was not movable. It stayed in the bottom position at all times and believe me you want that mattress to come up when they are really little. As soon as we would put AJ to sleep and then try to put him in his crib, he would notice the 2 feet or so of us lowering him into his crib. It was such a pain because he would always wake up. Anyway, for boys I love the modern look but make sure the mattress can move up or down. my vote (for whats its worth) is #1...i think it is the most timeless, and could so with so many different types of decor (if you plan to use again for #2--haha). Of all these options, my vote goes for #1, definitely #1. In my opinion us good to keep in mind: possibility to move up and down the mattress, not too short (the longer they stay in there the better for you), and non toxic finishes. I bought the Ikea Gulliver which is very affordable and simple (hubs didn't want to spend too much on the crib) and we love it. It's been a while since I had to buy a new crib but I do not think white is too feminine..it can be easily made more appropriate for a boy with all the great bedding available these days. I do love the retro #2..something different; great look. I think I'm preferring number one! :) Super cute. Your babe's room is going to be stylin' in no time! Oh boy, how exciting!! Ok I am not going to be very much help because I like the first and the last cribs... a very modern and a very traditional! Have you seen the crib review post that John & Sherry did over on YHL? I'll bet it's super informative and has lots of contemporary options. Just google it and I'm sure you'll find the article!! Good luck. so happy i found your blog today! i am your newest follower! i will definitely be stopping back by! 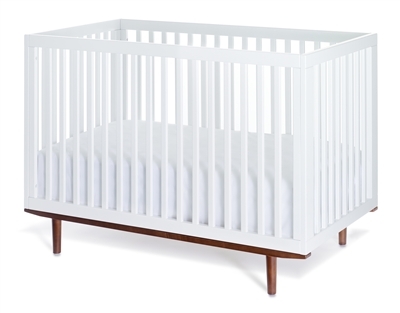 I like crib 3- don't know much abut that brand but I love the simple styling and the natural beech wood color- very chic and sort of scandinavian looking! We had a hard time picking out a crib too. We went with the Graco Charleston for our boy (due in April). The babyletto Mercer is awesome I love the white and dark contrast.. that one gets my vote! I like them all, but I just love the skinny mini legs on number one. Definitely get a crib that converts to a toddler bed/full bed, and if you plan on having more kids, maybe get a crib that could outlast two children. I have to admit number one is calling my name. My advice is follow your heart. . .and go classic enough that you can use if for all kiddos. The textiles and cute decor will steal the show! ;) Can't wait to see it all come together. I like option #3 - it seems the most versatile and combines both the traditional and modern look in one. Courtney had a good point for picking something that you could use for your future kids (girls!) as well - I think 3 would definitely work for either a boy or a girl! Hope this helps! oh girl wish i could help! Luckily my sis in law is giving us hers! The options for cribs and pretty much everything else for babies ;) is overwhelming! xo Excited to see what you end up getting! I think number one is my favorite!!! I love the 2 different color wood. Picking out a crib is such a hard thing...good luck! I say go with a unisex crib....for other babes after Baby Boy Schue! I had two cribs, both were white, one passed through the whole family - my 3 kids & all my nieces & nephews. It's all about the bedding to make it boy or girl and white is classic and never goes out of style! I had one that converted to a toddler bed and also had a pull out drawer underneath - both great features. what can I say...i'm super traditional and love the last crib. i am by no means a "modern" decorator although I do occasionally like it in other people's homes. I feel like it never goes out of style. Our crib was around 600 dollars but it is a three in one which means it can be a crib, toddler bed, and a full sized adult bed with a headboard and foot board! Makes me feel better about spending the money. :) good luck! love the cribs you chose! i'd have to say the last one is my favorite. a couple of things to think about: is it a convertible? meaning it can go from crib, to toddler bed, to full size? also, not sure if this is important to you and your hubs or not (it was for us) but we wanted an American made product. such as Young America, or PALI is another reputable brand. also, someone else mentioned this, but its super important that the mattress can move down...as your little one gets bigger you don't want him to climb out! My picks are definitely the 1st and 3rd crib. Insanely gorgeous! I would think they'd all have to have a non-toxic finish? But if not, I'd go with the 3rd. And, I actually like the finish with that style. Can't wait to see what you choose! I love the last one. I'm a much more traditional girl and this one looks classy and timeless, so it gets my vote! Naturally, I love #1 and #3 which also happen to be the most expensive. Also white is not too feminine for a boy's room. You can add so many elements to the room that won't make it look girly at all. I like #2 - it's masculine and modern and a perfect price! This is my favorite for the price... can't beat it!! I really like the 1st and 3rd ones! I also love the Netto Sleeper Crib. It's sleek and cute. We got ours at IKEA for $99. It's really basic, but we love it because it's sturdy and not too big.